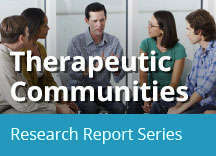 Home » Publications » Research Reports » Therapeutic Communities » How Are Therapeutic Communities Adapting to the Current Environment? Generally, the adoption of medication for the treatment of opioid use disorders has been slow due to a variety of attitudinal and infrastructural barriers (Volkow et al., 2014). However, societal understanding of substance use disorders (SUDs) and mental illnesses as biological disorders has grown, and with that has come wider acceptance and use of medications in the treatment of addiction, including maintenance treatments for opioid addiction using the opioid agonist and partial-agonist drugs methadone and buprenorphine. Detoxification from opioids without the support of medications has shown little success in reducing illicit opioid use (Fullerton et al., 2014). Randomized controlled trials (RCTs) of methadone maintenance treatment, particularly when dosage is managed appropriately, indicate that this medication has a positive impact—including improved treatment retention; reduced illicit opioid use; and decreased drug-related HIV risk behaviors, mortality, and criminality. A meta-analysis of RCTs suggested that methadone maintenance treatment appeared more effective than behavioral treatments in retaining patients in treatment and reducing heroin use (Mattick et al., 2003). RCTs of buprenorphine maintenance treatment strongly indicate that this medication improves treatment retention and reduces illicit opioid use compared with placebo (Thomas et al., 2014). Because they viewed themselves as an alternative to medical treatment for addiction, therapeutic communities (TCs) historically held a strict no-drug policy, which extended to psychiatric medications and medications for addiction treatment (Perfas & Spross, 2007). As evidence has increasingly demonstrated that incorporating medications into treatment improves outcomes compared to behavioral treatment alone, a growing number of TC programs now accept patients receiving them or even incorporate medications in the treatment services they provide. TCs supporting individuals receiving maintenance therapy with addiction medications educate both staff and participants about those medications to counter the misconception that they are a "crutch" (Greenberg et al., 2007), one of the attitudinal barriers historically impeding their wider adoption. Individuals on medications for addiction treatment participate in groups where they learn about their medications and the need to keep regular appointments once they return to the community. Until recently, TCs had no specific length of stay, following the belief that individuals should progress through the program at their own pace. However, the rising cost of health care and tightened budgets among public agencies have shortened lengths of stay in addiction treatment programs, putting pressure on TCs to limit long-term residential therapy (De Leon, 2012; De Leon & Wexler, 2009). Over the past two decades, expected stay length has shortened, initially to around 24 months, and now to 6 to 12 months (De Leon & Wexler, 2009; De Leon, 2010; Vanderplasschen et al., 2013). Financial constraints are now putting pressure on TCs to shorten planned treatment durations even further, although studies consistently show that 90 days is the minimum duration of treatment needed to realize long-term benefits (De Leon, 2010; Vanderplasschen et al., 2013). Public financing funds the majority of substance abuse treatment services, which is not true of general health care (Buck, 2011). Recent health care reforms such as Medicaid expansion, the Mental Health Parity and Addiction Equity Act, and the Patient Protection and Affordable Care Act (ACA) are expanding access to and coverage for substance abuse treatment for greater numbers of people. These changes, coupled with declines in state spending, are providing incentive for addiction treatment to integrate more with general medical care (Buck, 2011), provide more evidence-based treatments, and improve tracking of patient outcomes (Smith, 2012). One aspect of the ACA presents potential opportunities, along with some challenges, to TCs. To improve access to health care for those who have been underserved and marginalized, health care reform guidelines recognize an organization that meets particular criteria as a Federally Qualified Health Center (FQHC or a "medical home," also called a "patient-centered medical home"). A TC that joins with a medical partner has an opportunity to become a FQHC if the collaborating organization can demonstrate the capability to provide integrated health care that includes both primary care and preventive services. A recent report describes the merger of Walden House (a well-established TC) with the Haight Ashbury Free Clinics to act as a medical home that provides integrated health care services for people with addiction, co-occurring disorders, and other problems (Smith, 2012). More research is needed on the effectiveness of these modified TC approaches, particularly in the context of health care reform and the changing addiction treatment landscape.